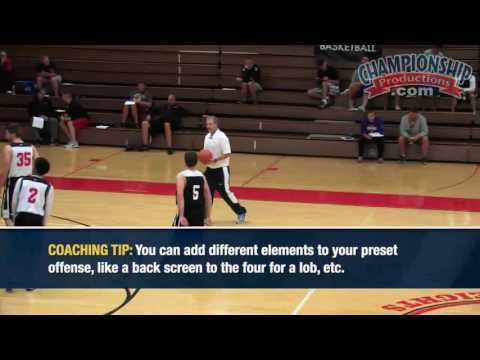 Learn how to run a fast break offense in which every offensive player has a chance to score! Many coaches attempt to control the tempo of a game with their defense. However, Tom Billeter believes in controlling the tempo of his games with his offense. In this video, you'll learn how to implement the "pre-set" full court offense Coach Billeter used to average over 90 points per game and win the 2016 Division II National Championship. This offense is a fantastic way to get the defense on their heels and forces mismatches that your team can easily take advantage of. It also puts a ton of pressure on the defense to get back, communicate and match up. What Billeter calls his "Pre-set" offense is really a secondary break where he takes advantage of the defense not yet being set. With some simple concepts, he's able to get his athletes immediate looks at the basket. Players love this offense, as it allows them the opportunity to get out and run. Even though there's a structure behind it, the options available to the players are numerous. Using on-court demonstrations, Billeter illustrates where each player belongs and the rules for the offense. The offense includes cutting, ball screens and pick & pops. The spacing is ideal for basket attacks, penetrate and kick, and paint touches - all actions that cause defenders to run or recover, leading to open shots. Additional actions built into the initial preset allows for you to add as many layers of complexity as you want into your transition attack to put a defense in a bind. One such action is the Pipe Option, which uses a zipper style cut (pipe) to set a mid ball screen with different reads. The possibilities of a post-up or a middle pick & roll are presented. Off of the middle pick & roll, more options are presented. One such action comes off of roll-and-replace action that can lead to an immediate high-low entry. Another option is the pass to the wing with a side pick & roll with the big man, who's given the instruction to "roll to range." Billeter illustrates how he practices the full court offense by using the Circle Drill. The drill starts with players circling around the free throw circle with one team getting the rebound. From there, the rebounding team comes down the court to execute the full-court offense, sometimes against seven defenders. In this drill, your players will get an understanding of how to play offense when facing defense. When opponents apply a full court press, Billeter believes in playing fast, attacking it, and looking to score. He presents a press offense that can be used to attack all different forms of full-court pressure. Multiple options are shown to attack with ball reversals and how to attack up the sideline. With this "pre-set" full court offense, your team will not only score more, but will tire opponents and control the pace of the game! Produced at the 2016 Cleveland (OH) clinic.